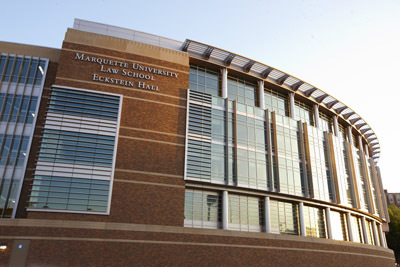 In 2010, Marquette University Law School opened Ray and Kay Eckstein Hall, which we regard as nothing less than the best law school building in the country. The boldness of Eckstein Hall establishes a new and exciting commons, where both study and open discourse on law and public policy flourish, with Milwaukee itself as both a backdrop and a beneficiary of our vision. The four-story Zilber Forum in the heart of the building serves as a gathering spot and encourages a sense of community. The Ray & Kay Eckstein Law Library combines a strong print-based collection with superb technology and professional support services. The trial courtroom provides an authentic environment for training students. The appellate courtroom serves as a ceremonial courtroom for moot court finals and visits by appellate courts as well as being a place to hold lectures,presentations by guest speakers, and public debates. The welcoming, two-story Aitken Reading Room offers expansive views towards downtown and a comfortable environment where students immerse themselves in the traditions of the law. A chapel on the fourth floor, named for St. Edmund Campion, S.J., provides a place of quiet reflection for all members of the law school community any time the building is open and is the site of monthly Masses during the academic year. A fitness center, also on the fourth floor, includes an equipment workout room, lockers/shower facilities, and an exercise room where fitness classes are taught. A "faculty cluster" groups offices in a way that encourages dynamic interaction, research, and mentoring. A conference center on the fourth floor hosts important events, including debates on pressing questions of the day, annual Restorative Justice Initiative conferences, and continuing legal education seminars. The Tory Hill Cafe serves delicious meals year-round and has become a place not just to be nourished but to enjoy the companionship of fellow classmates, faculty, and university colleagues from across campus. A two-story underground parking structure facilitates easy access for guests and, on a first-come-first-served basis, members of the Marquette Law School community, including students.